In today’s day and age we want visuals. Smartphones, smartwatches, advertisements while you fill up your gas tank, and adds while you shop at Wall-Mart. We live in an age that is highly visual even if you are not a visual learning yourself. With that in mind as Christians trying to explain the complicated issue of the Trinity, we want to give someone a visual understanding or analogy of what the Trinity is like. Here’s the thing. . . This idea tries to imagine that the Trinity is like a three leaf clover of which the Father, Son and Holy Spirit are each represented by one of the leaves of the clover and with all of those leaves together you have the being which is God. Problem? This means that neither Jesus, nor God the Father, nor the Holy Spirit are fully God without the other. Take away one leaf and the other two are not God on their own. The Fathers of Christianity dubbed this Partialism and declared it a heresy in the Athanasian Creed in 5th century. Use a clover with three leaves, an egg made of shell yoke and white, an apple with the skin, fruit and seeds, or an Oreo all of these are of the partialism heresy ilk. This analogy was the one I grew up on, and I’d bet many of you did as well. The idea here is that God each part of the Trinity is represented by the different states in which one finds water as a solid in ice, a liquid in your favorite pint glass and gas when left the kettle starts to sing that oh so glorious call. Problem? This idea would actually mean that God is one both in being and in person. God is no longer three different persons but appears in each form as he pleases or at different times. In a sense this would actually be what Hindus believe about Krishna in that he appears as in different forms and as different Gods at various times and places. This was declared the heresy of Modalism by the Church fathers in the 4th century. Use water, say that God is like an actor who plays different roles, say God a person who is both a son, father and student all of these are teaching modalism. 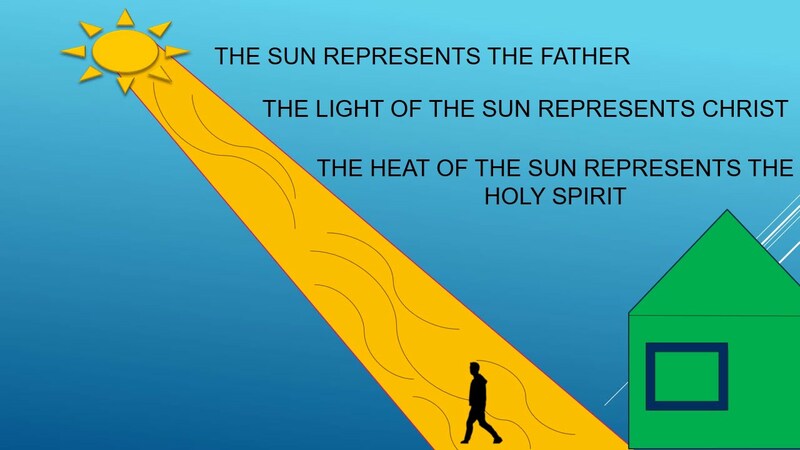 This analogy proposes that the Trinity is comparable to the sun, light and heat in which the sun is God the Father, The light represents Jesus and the heat represents the Holy Spirit. Problem? This makes the Father really the only divine being since now the Holy Spirit and Jesus would be products on the sun. We know that Jesus and the Holy Spirit are not created beings so this was declared the heresy of Arianism by the church Fathers in 4th century. This is also the Jehovah Witness view. Use sun, light heat, or factory, factory worker, and product, or some other odd concoction all of these are some breed of arianism. Maybe you should wait check out my previous blog on the subject How the Trinity isn’t logically impossible and . . . Oh the tesseract!, and also wait for my next one where I’ll share about the ‘trinity triangle’ which is the closest we can get for an analogy to explain the Trinity.